I’ll be trying to get on the bike as much as possible during this block, which includes January and February. The biggest challenge is finding the opportunity. I used to do all of my biking during Baya’s naps because she’s been (for the most part) predictable and I’ve even gotten up to 2-hour rides on the trainer in during her naps. Myles is certainly another case entirely. Sometimes he’ll take a good non-stop nap of 2 hours or slightly longer. More often though, he will wake up during it and while sometimes it can be quick in getting him back down, other times it can take 40 minutes or more, or he may refuse to go back to sleep altogether. Since he’s inconsistent at wake-up time and if he still takes a morning nap as a result, he’s also harder to get consistent at the time he goes to sleep for his nap. He’s been as early as noon and as late as 1:45. It’s hard to make plans that count on him. Whenever I think we’re in a rhythm finally, it gets a wrench thrown into it. 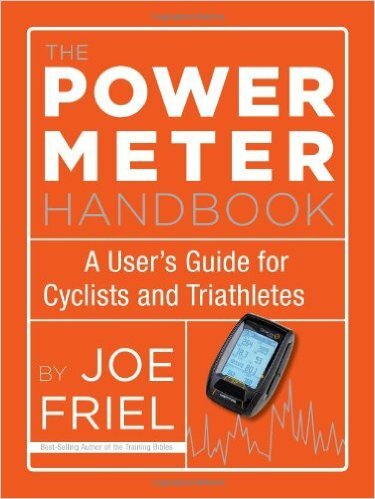 I’ve been learning a LOT from my new book, “Power Meter Handbook” by Joe Friel, and it’s affecting my bike training. For January, my focus is on aerobic endurance, and then muscular force and speed skills. He’s given me a more precise target range for the aerobic endurance (which is actually based on heart rate – being in zone 2, but would be at a moderate intensity), and I’ve never done the muscular force and speed skills as he explains them. For muscular force work, you get in a big gear, stay in a seated position, come to a stop, and then pound it as hard as you can for 6-12 revolutions, aiming for watts that are twice your FTP. I actually really like doing these. For speed work, I’m doing high-cadence drills that last a few minutes for each interval, and are done at a cadence level that is slightly uncomfortable and maintained for the duration, in hopes of extending the duration of each interval of the course of several weeks. This is to improve pedaling efficiency. I’m pretty pumped about making gains in these areas! Come February, I’ll continue with the aerobic endurance and lengthening the duration, but then I’ll be doing less muscular force and more muscular endurance. These will be the classic 2x20’ (5’) “sweet-spot” intervals at around 88-93% FTP. The purpose of this workout is to increase Functional Threshold Power. I’ll incorporate speed skills into warm-ups if I can’t get them in elsewhere during the week. I hope to bike 3-5 times/week. I’d like a minimum of 4 times, but I know life happens (or shall I say, Myles happens). I’ll continue to swim 3 times per week, but I’m cutting back on my yardage. I’ll keep my runs at an easy pace still, with some strides, and a weekly long run. I’m shooting to still hold on to 6 days a week of running. I’m looking forward to this block, even though I know it’s also a painful one!